A lease must name every adult (over 18) intended resident. By signing the lease, these named occupants acknowledge their legal responsibility to pay rent, maintain the property, and follow the rules. If the person is not listed here, a landlord will be hard-pressed to collect a judgment for unpaid rent or evict. Obviously, the heart of every lease agreement is the rent term. However, it is surprisingly easy to make mistakes in these provisions. Make sure the rent amount stated is accurate and consistent. Many standard forms set out both an annual and a monthly figure — these figures need to add up. Also, the written and the numerical figures must be identical. Rent provisions must describe the methods of payment allowed. Standard forms often provide a grace period. This option is traditionally needed only to accommodate mailed-in checks. Be careful when crafting a grace period — this can actually encourage late rent payments. A security deposit should be identified separately from the rent agreement and it must be clear what the deposit represents. Some leases will state the time-frame when the deposit is due to be returned. That date should be no sooner than required by law. Pet deposits should only be designated if the funds are in addition to the general deposit and to do so does not violate state law. Other fees may be allowed, like bad check charges. Late fees are particularly problematic.These fees must only reflect any actual losses, like late penalties on a mortgage or costs of chasing down the rent. A late fee provision that allows a landlord profit beyond that is generally not enforceable. Because late fee provisions are controversial, your attorney may suggest separating a late fee provision from other provisions concerning rent or deposits. That way it may be easier to convince a judge to simply ignore the provision but allow the rest of the lease to stand. Otherwise, like in the case when a late fee provision is deemed “addition rent,” and the late fee is illegal, that language could impact the enforceability of the lease as a whole. The length of the lease is important to the overall profitability of the rental. While many landlords prefer long-term leases, this practice can lead to problems like neglected repairs, tenants who secretly sublet, or tenants who no longer qualify for the property. Long term leases also may be inadequate when it comes to maintaining the highest rent. The disadvantage of shorter term leases is the expense of finding new tenants more often. Regardless of the length of the lease, a landlord is typically best served by negotiating a set term. As the termination date approaches, the landlord can decide whether to invite a tenant to stay on — a convenient and cost-effective way to get rid of a bad tenant saving the landlord the trouble and expense of eviction. It may be best to avoid automatic renewal provisions or a lease that reverts to month-to -month because these take decision-making power away from the landlord. If tenants are to have specific responsibilities, like shoveling walks or mowing lawns, that should be an essential term of the lease. Then, if the tenant fails to comply, it’s easier to argue a material breach of the lease — a legal requirement to evict the tenant. If there is a method for reporting repairs, this should be in the lease. That provision can be critical to winning a security deposit dispute where a tenant is claiming prior damage. Tenants should be required to report repairs immediately to avoid property damage. Along with these provisions, the lease should have a corresponding right for the landlord to routinely inspect the property to confirm it is being properly maintained. A guest policy protects the landlord, as well as other tenants, from strangers who move in mid-lease. It prevents the classic ‘bait and switch’ scam where a friend or family member secures a lease for someone who would not qualify on his or her own. 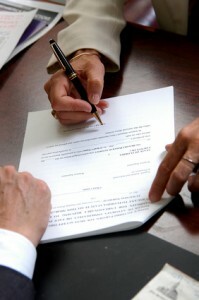 The lease must define what constitutes a long-term guest and these persons must undergo a tenant background check. Tenants should be warned they are responsible for the actions of their guests, subject to eviction. Legal occupancy limits also must be followed. Provisions regarding subletting can be included and should require written consent by the landlord. The lease should include restrictions against business use, unless otherwise negotiated with the landlord. The ‘work at home’ option may be fine in many cases, but could give rise to complaints from other tenants over sticking points like noise or parking. Also, the business activity may increase the landlord’s liability or increase the landlord’s costs. Tenants must acknowledge that criminal behavior on their part or their guest’s will lead to an eviction. The Crime Free Multi-Housing Program can provide the language for this lease provision. Make sure to carve out an exception for victims of domestic violence. It is generally a good idea to refer to nonsmoking or no pet policies in this section of the lease. By doing so, it’s easier to argue that violating the policy is a material breach of the lease, and the landlord should be entitled to evict the problem tenant. In addition to these essentials, landlords typically will include disclosures such as lead or mold, any other necessary addendums required by local law, as well as specific house rules governing day-to-day issues like parking, noise, or use of common areas. A good practice is to have a local landlord attorney review the lease initially, and again if any changes are negotiated.